With the adoption of 5G NR as the worldwide 5G standard, developers and service providers are now tasked with finding appropriate and effective wireless test tools to enable first-to-market success. 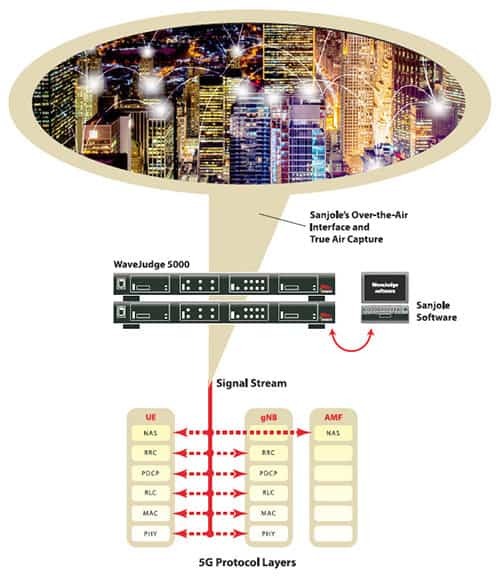 The Sanjole WaveJudge has been a solid over-the-air test solution for emerging wireless technologies and continues to prove its worth with its new 5G module. This is the first over-the-air 5G monitoring solution to give you visibility into the interaction between protocol and physical layers in wireless transmissions. Using high-speed programmable hardware for in-the-field updates, the module ensures scalability and investment protection by operating as a plug-in component for the industry-leading, full-featured WaveJudge 5000 platform. It eliminates the need to rely on unproven single function 5G test systems that lack the comprehensive and multi-functional test architecture of the WaveJudge platform hardware, software and user interface. Click to request one or more of our informative LTE or WiMAX Product Brochures. Taking place 25-28 February 2019, with events being staged at Fira Gran Via, Fira Montjuïc and La Farga L’Hospitalet, MWC19 Barcelona is set to attract more than 107,000 professionals from over 200 countries and territories. Sanjole’s WaveJudge 5G wireless test module will be featured at MWC 2018 in Barcelona, February 26 to March 1, 2018.